When Roku updated their iOS remote control app a couple of weeks ago, the company also promised that they were still working on a version for Android. 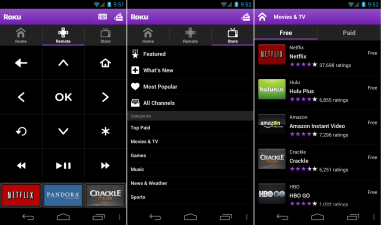 Sure enough, Roku has released the Android version of their remote control app to the Android Marketplace. The new Android app includes all of the features of the iOS version, including the latest in D-pad style control schemes, although interestingly enough it appears that the channel shortcuts have been moved to the bottom of the new layout. As with the iOS app, the Android app is free. Roku owners who walk on the Android side of the aisle have reason to celebrate: the company has released a version of its remote control app for Google’s mobile platform. The app will work with any Roku box and any Android device running version 2.1 or higher, as long as they’re both on the same Wi-Fi network.